Texas persimmons are known for juicy fruit and smooth bark. Only female trees bear plum-flavored fruits, which ripen by October and measure about an inch. When green, the fruit is highly astringent and not safe to eat (if you do, stomach problems are guaranteed). 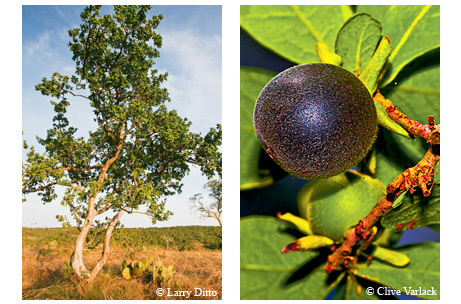 Diospyros texana ranges primarily across Central and South Texas (and the eastern part of West Texas) in a variety of soils. A slow-growing member of the ebony family, the species — also called Mexican persimmon, black persimmon and chapote — rarely measures taller than 10 feet but sometimes reaches 40. Flowering begins at age 5 or 6. The small white blooms, shaped like petaled bells, appear in March and April but are hardly noticeable because they droop upside-down. Their pleasant fragrance, however, gives them away. So do the bees, butterflies and moths that they attract. Dan Hardy, who lives west of Austin, admires the Texas persimmons that grow in his yard for yet another reason. “They have a gray bark that peels away like a madrone and leaves a smooth bark underneath,” he says. Pretty, yes, but expect a long wait before a Texas persimmon starts to peel — at least 10 years from germination.